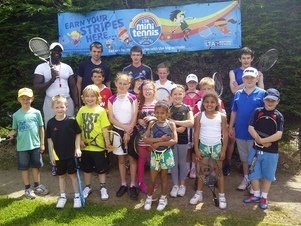 Rainford Tennis Club have been running Junior Tennis Camps during the summer holidays at the Jubilee Recreation Ground with record numbers attending from across St Helens. The camps have been run by our Head Coach, Samuel Jalloh, and his team of volunteers with the youngsters in attendance enjoying tennis, table tennis and football from 9.00am – 3.00pm each day. "Players of all ages and abilities have been coming each day and everyone has enjoyed the activities at the Club" said Samuel. "Tennis is a game for all and we are always looking for new tennis players here at Rainford."